Pictures and full quotes MICKEY MOUSE THE PRINCE: Let me go, I say! How dare you! You'll pay for this, Captain! I command you to put me down right now! CAPTAIN PETE: After the pauper's crowned, it will be adieu for you! DONALD DUCK: Hey, get me outta here! I'm the prince's valet! Your Highness! Your Highness! We're saved! Wait a minute! You're in here, too! We're doomed! MICKEY MOUSE THE PRINCE: The coronation! HORACE HORSECOLLAR: My lord. MICKEY MOUSE THE PRINCE: This charade has gone on long enough! I demand you open this door immediately! WEASEL 1: Aw, shut up. Well, looks like the boss ain't wasting any time. 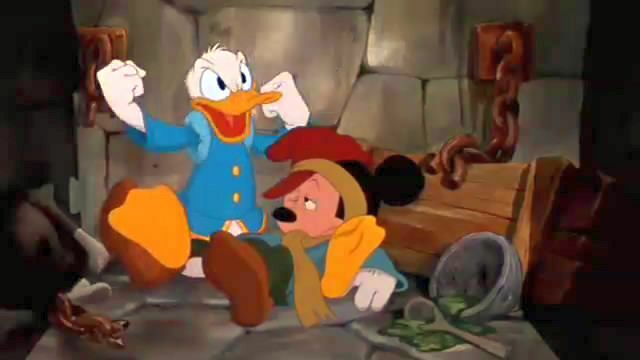 DONALD DUCK: Now I lay me down to sleep, I pray... WEASEL 1: Be my guest, pal. Hey, what's the big idea? GOOFY: Sorry. You wouldn't happen to have an axe I could borrow, would ya? WEASEL 1: Thank you. I've had a lovely evening. GOOFY: Gosh. MICKEY MOUSE THE PRINCE: Goofy! GOOFY: Just sit tight, little buddy. I'll have you outta there in a jiffy! ARCHBISHOP: Ahem. Be seated, sire. MICKEY MOUSE THE PAUPER: After you. ARCHBISHOP: No, no. Beauty before age, sire. MICKEY MOUSE THE PAUPER: Oh, no. Age before beauty. ARCHBISHOP: Your Highness, you're such a sport. Sit down! MICKEY MOUSE THE PAUPER: Got it. 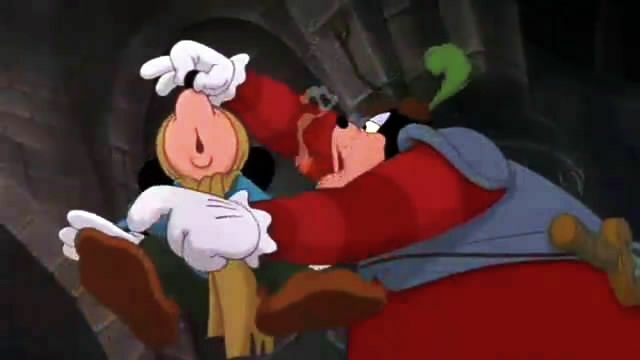 GOOFY: Now let me see here: was it the skinny one or the round one or the fatty? Maybe it was this one. Shoot, I know I had it. Maybe it's this big one... WEASEL 1: Get 'em, boys! GOOFY: Gosh. That thing's sharp. ARCHBISHOP: It is both my duty and pleasure to crown you. To crown you... To... I say, a rather wiry lad. To... So slippery. Would you hold still? MICKEY MOUSE THE PAUPER: Stop! CAPTAIN PETE: What the? 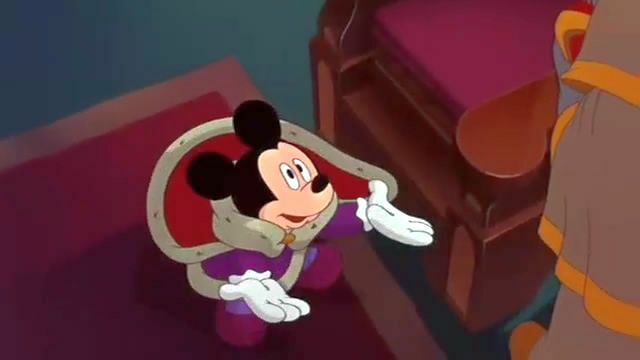 MICKEY MOUSE THE PAUPER: Look, I'm the prince, right? And whatever I order must be done, right? ARCHBISHOP: Uh... Yes... MICKEY MOUSE THE PAUPER: Well, then... The captain is an insolent scoundrel! Guards, seize him! CAPTAIN PETE: Seize him! He's an impostor. MICKEY MOUSE THE PRINCE: But I'm not, Captain. CAPTAIN PETE: Huh? MICKEY MOUSE THE PRINCE: Thank you, guardsman. MICKEY MOUSE THE PAUPER: Oh, boy! CAPTAIN PETE: No, no. Wait a minute, Your Majesty. I can explain everything. MICKEY MOUSE THE PRINCE: Very well. I await your explanation. CAPTAIN PETE: Your Majesty is too kind. MICKEY MOUSE THE PAUPER: Look out, sire! GOOFY: Geronimo! Hold on, sire! I got you now, ya varlet! MICKEY MOUSE THE PRINCE: Fooled again, Captain. CAPTAIN PETE: Huh? Get out of the way! MICKEY MOUSE THE PAUPER: Oh, boy, am I glad to see. I mean, what a time I've... ARCHBISHOP: But you see, I... Which... Good heavens. Which one is which? MICKEY MOUSE THE PAUPER: Pluto! Oh, boy. I guess there's no fooling you, boy. ARCHBISHOP: Therefore, I crown you Prince of England. King. King. King. King of England. ALL: Everybody sing a toast to the king! GOOFY: To the king! 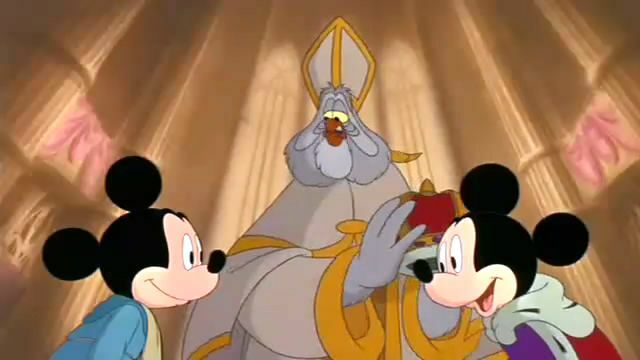 MICKEY MOUSE THE PAUPER: To the king! ALL: To His Majesty the king! To His Majesty, Royal Majesty! To His Royal Majesty the king MICKEY MOUSE THE PAUPER: Long live the king, yeah! 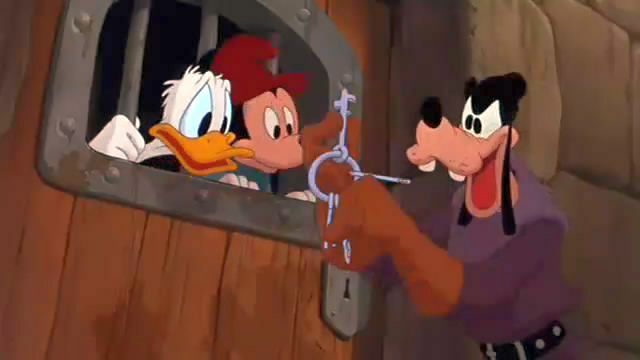 GOOFY: Gosh. 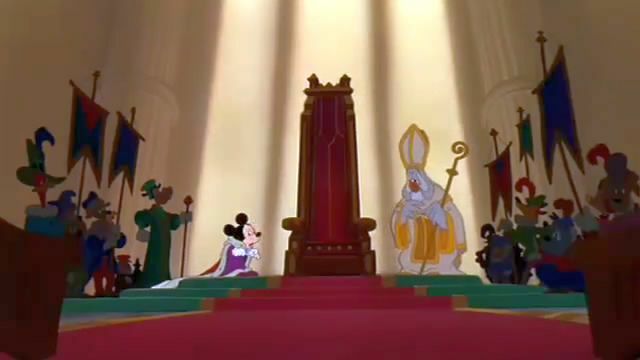 NARRATOR: So, with his loyal companions Mickey and Goofy at his side, the young king ruled his happy country as he'd sworn he would: with justice and compassion for all.